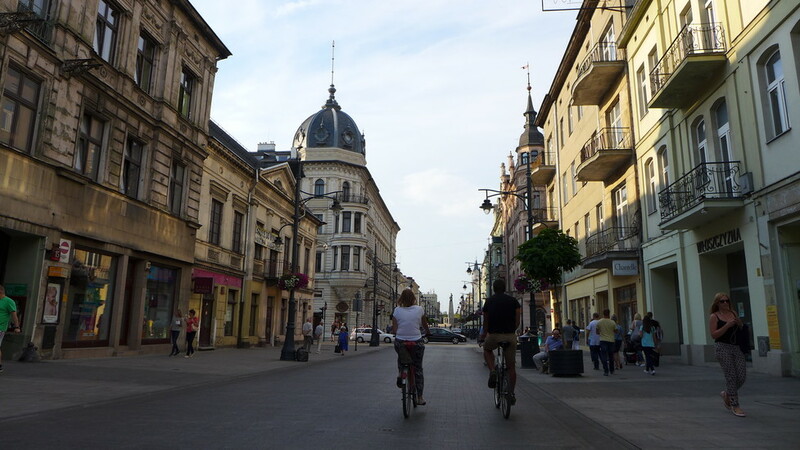 In general, Łódź is a bit too young and postindustrial to ever be considered an 'attractive' destination in the classic European mould of cobbled streets and ornamental architecture (Kraków it is not). It does, however, have the potential to be a popular 'alternative' destination some day soon, and in the midst of massive changes and ongoing construction, you can catch early glimpses of this unfinished city’s enormous potential. 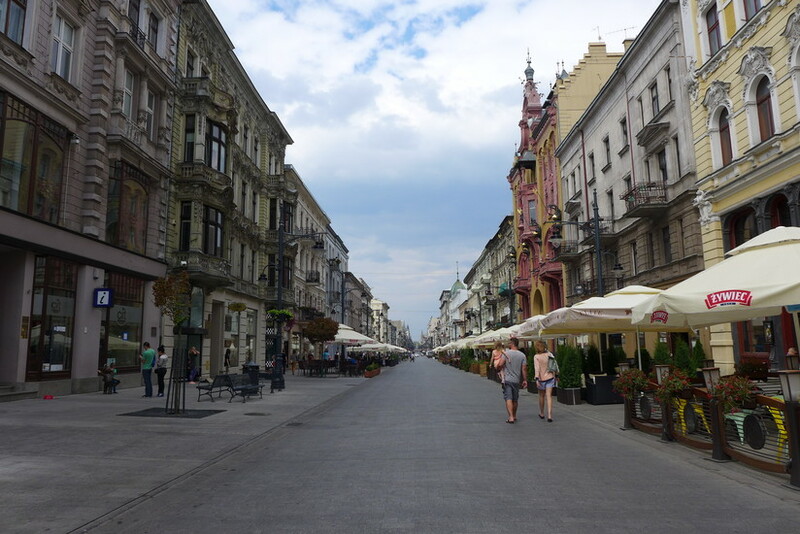 And there’s no better place to see the past, present and future converge than in the stream of the city's long pedestrian thoroughfare - Piotrkowska Street. 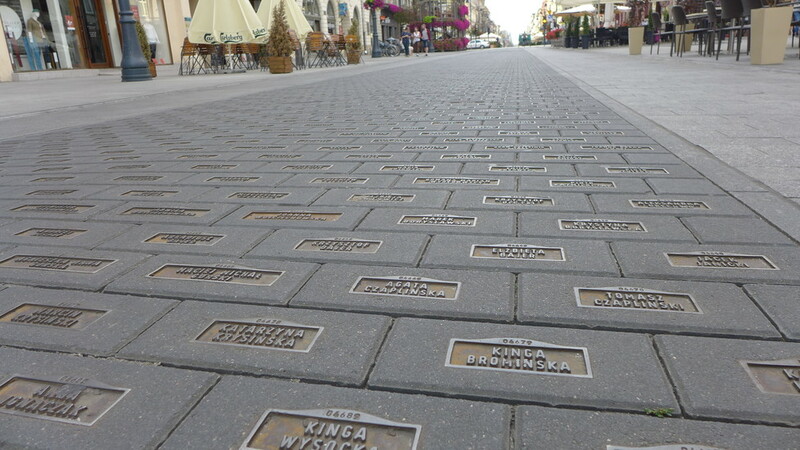 This engaging five kilometre catwalk is Łódź's primary playground, and personifies everything this city is attempting to achieve in the coming years. 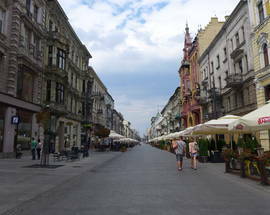 It's with good reason that visitors will spend a significant amount of time on this street and its capillaries: the quality of the dining and nightlife options here on Łódź's high street is steadily improving, and its sustained straight-as-an-arrow span make food tasting, pub crawling and club hopping a seamless, and seemingly endless, endeavour. 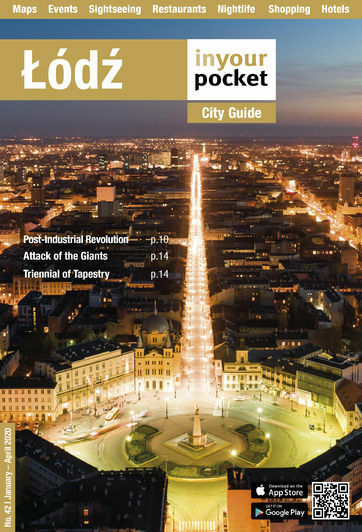 Follow IYP as we give you a personal tour of some of the highlights of Piotrkowska - the lauded central artery at the very heart of Łódź (and Poland itself, for that matter). Though beginning a journey down Piotrkowska at the north end (just south of Plac Wolności, C-2) is perhaps a rarity for locals, let's just do that. While walking south, keep in mind that odd-numbered addresses are on the right, and even-numbers are on the left. To get started, there’s a neat little surprise through the courtyard of Piotrkowska 3 - a mirror mosaic pressed into the wall of an abandoned 20th century hotel. It’s a great Instagram opportunity if you’re into that kind of thing. Back on the street, keep walking...and walking, past the knock off KFC, and stop at the crossing. Hot tip: people in Łódź wait at pedestrian crossings because it’s very common to be fined for jaywalking. Niebostan at Piotrkowska 17 is worth a gander. Go in the courtyard and up the unsuspecting staircase in the middle. Come nighttime it’s packed full of hipsters wishing to escape the more ‘mainstream’ Off Piotrkowska - and a solid beer selection however don’t get fancy with your cocktails. Right, now you’re going to keep walking past the pizza belt - Presto will give you a very ‘Dolmio Day’ and Biesiadowo Pizza is very much to be judged by its cover. Pizza is popular in Łódź. Why? Because it’s relatively cheap, filling and very student-y. From now till number 52 you can look around and gaze though it isn’t pretty, yet. When you arrive at 52 you’ll have to try Zapiekarnia & Plackolandia - this typical late night eatery is full anytime of day. Partially due to the great Zapiekankas (grilled open sandwiches) and the slow service. Worth the wait though. Notice, by the way, I’m not mentioning any ‘Kebab’ places, that’s on purpose. We’re starting to get into central territory. Czekolada at Piotrkowska 55 (down the alley), is part of a Polish chain of Nightclubs that spans across major cities. It’s known for its Wednesday Ladies Nights and the beautiful people that it attracts (around 12am is best). There’s hope for things to come around this area as there’s a few vacant lots ready for the next restaurant or club to make their mark. New York Music Club a new Hard Rock Cafe stylised place has just opened opposite, that’s causing some stir with its respectable live bands and appealing menus. The next cut off point is one of the prettiest, it’s on the corner where you see a wooden Polish restaurant called Chłopska Izba. Along that courtyard are two polar opposites: Ato Sushi has earned itself the spot of being ‘Łódź’s best Sushi’. It’s a high-end, take a date, dress nice kind of place. Service is a bit slow but grab a pot of cherry green-tea and sip away for a bit whilst waiting & watching people walk by. On the other end of the spectrum you have Manekin; no matter what time of day, it will be full and probably have a line out the door. It’s affordability for the masses to eat is the key to its success, the product is average and the service is very impersonal: but whatever they’re putting in their pancakes is what the majority of Łódź is eating. Somewhere else the regulars hit up is Bistro. This midday till late, semi-dive-bar with its pink neon and mannequin strippers is a famous watering hole in Łódź for the pre-gamers. It’s popular with students and everyone else. The usual journey for post-Bistro is to head on over to Kokoo. You’ll either see the sign or see the line but it’s one of Łódź’s most popular clubs. Come Friday and Saturday it will be full. Upstairs is for the more ‘house’ appreciative clientele whilst downstairs is usually in full R&B/Rap/Twerk mode. I’ll be honest here - you’ll read about Bedroom which is just around the corner from Kokoo. It’s dead. Unless they have a huge headliner, it’s not worth the visit. 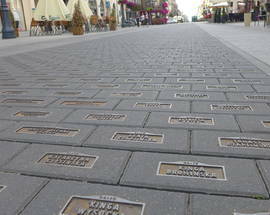 We’re coming up to one of the best places in Łódź to eat. Irish Pub. Oh yes. Even though it’s branded as a pub, think more gastro-pub. It’s got a great modern menu, with a few classics that I can’t speak highly enough of. Even though the interior is a bit painfully stereotypical, the food is well worth it. It’s not somewhere you want to stay all night though. Wandering up Piotrkowska at night you’ll immediately see what’s worth checking out as there will be people crowding the bars and lined up outside of the clubs. 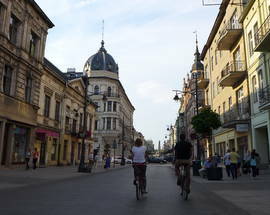 It’s very common for locals to choose their ‘places’ in Łódź and then stick to them. Rarely is ‘the new place’ given a chance. High-class Loża awaits you on Piotrkowska. Loza is accessible only at night via red carpet, Mayfair staircases and into a regally renovated town house. Usually full of VIP’s it’s the kind of place no ‘youths’ will enter, nor anyone really looking to let loose. It’s the place to be seen during those mid-life-crisis years and yes you will have to pay for those blonde goddesses coming to your table. Next stop on your journey should be ShotMe - It’s got an easy approach to creative shots that are selfie worthy and a good way to start the night. The place fills up fast and you’ll probably meet some friendly people around there so it’s a good introduction to the city. If you are looking to explore the club scene further you’ll most likely end up with these other ‘friendly people’ in 1 of 4 clubs. The first is Lordi’s with its typical nightclub EDM styled music pumping over two floors of purple and red enormity. It’s the biggest club in Łódź and arguably the most popular. You will go crazy at Lordi’s if it’s your kind of place. Glow is the second. Glow is Łódź’s baby on the block. It’s very popular with the young crowd (too young) and is famous for its easy hang-out terrace and lively, well organized parties inside. It’s a Marmite kind of a place, you either love it or you hate it. Abracadabra & SODA are the 3rd options with their no-nonsense approach to being something different in the city. Although two separate clubs on the outside, they’re freely accessible to one another inside. Abracadabra caters to the more middle aged clientele whilst SODA is its younger more energetic brother. Friday’s at SODA are some of the best in the city. And the 4th option is Off Piotrkowska. Now, before we get to Off we have to take a moment to talk about Foto Cafe 102. This little hole in the wall near Lordi’s is arguably Łódź’s most popular cocktail bar. It hosts great and creative cocktails with a friendly and knowledgeable staff that has earned it respect nationwide. Ask for Bartek Wójcik at the bar and you’ll be taken care of. Now to Off Piotrkowska. This run down, alternative place is a bit of a walk but is like a mini-city unto itself. It boasts a couple of clubs, a karaoke bar and a handful of restaurants - the best of which is by far Tari Bari. Yellow is hipster to the extreme with an out of place clothing section and a mish mash of funky furniture that’s great to lounge around in. Spaleni Słońcem, as much as it tries to be - is not a cocktail bar. It is somewhere people go to sit and drink beer outside. Occasionally it has an outside cinema set up showing an array of Polish & international titles. DOM is a habit hole of a club that has a good vibe come late night with a good crowd and usually a very ‘house’ mood - if you’re into it. And so ends our Tour-de-Piotr, I hope you enjoyed. It’s difficult for me to imagine Łódź growing into something more than the beautiful tragedy it already is. It’s growing, fast and needs time to fit into its new shoes. The new fast pace of nightlife and gastronomic, Łódź has proved it can be picky, and even utterly unkind. But in a way, this filter can also lead to good things. A no nonsense approach to what’s accepted and acceptable. There’s potential for a quiet cocktail night, a raving Smirnoff fuelled smash or a calm afternoon drive around the center to explore just what this city has in-store. On the whole, you’ll either love Łódź or you hate it (the Marmite of Polish cities). But it’s not a quiet city, nor one that goes down without a fight, it will go to great lengths to show you just how deep under your skin it can get.